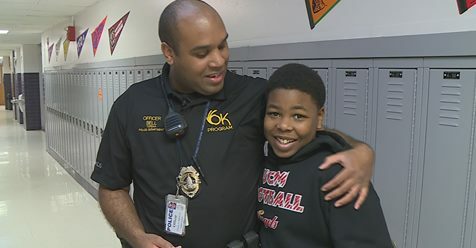 However, there's one Topeka Police Officer who is doing everything he can to guide some of the Capital City's most at-risk youth in the right direction. "A lot of these boys look up to professional athletes and people like that. Well, you can't call LeBron James, but you can call Officer Bell," said Bell. All 88 members of Officer Timothy Bell Jr's "OK Program" have his personal cell phone number, and he explained how they are not shy about using it. "I've gotten calls at 1 a.m. when something has happened and they needed me." OK Program volunteer Sean Hall says bell goes far above and beyond the call of duty when it comes to the kids that he serves. "I can tell you that officer Bell sacrifices his own resources. That he has a personal relationship with each boy in the OK Program, that he makes home visits and school visits. He his more than a mentor, he's a friend to these young men. He's instilling values into them that they have no idea what they're missing," said Hall. The OK Program was created in California back in 1990 to help reverse the high rates of homicides and incarcerations among young African-American males. Bell was instrumental in bringing the OK Program to Topeka, and in just over a year, it's already making a noticeable impact. "I've had one boy who was in the office 40 times last year. He hasn't been there once this year. When you see those kinds of turnarounds because the boys want to do it, it's pretty awesome," said Bell. Hall is one of Bell's mentors and an OK Program volunteer. He says the program's proactive approach will pay off big in the long run as well. "He's getting in front of them being in front of a gun. He's being in front of them being incarcerated. He's being in front of them being in a grave," said Hall. In our interview, Bell was quick to downplay any credit he might be due, however, the impact he's having speaks for itself. "You go over there and we play basketball. We have a discussion about what's happening in this community. Sometimes there are shootings everywhere and they need a safe place to go and talk to somebody," said OK Program participant Leon Smith. Smith is a 7th Grader at Eisenhower Middle School in Topeka. The OK Program is most active at Eisenhower Middle and Highland Park High Schools. "We bring the kids here on Saturdays and feed them. I bring other men from the community together and then we have discussions about topics of things that are going around the nation. A lot of times we do talk about, you know, some of the controversial police shootings and things like that. It's good for the boys to have an open forum amongst themselves, or we can all talk about it, and they can talk about it with a law enforcement officer. And they really get an understanding of how things happen from a police perspective and how things work from theirs," said Bell. Bell says the most challenging part of his job is when someone is having issues at home. "You really just want to give them a hug, tell them you love them, and tell them everything's going to get better, but I'm not an immediate fix to some of those things. It's tough because there's a lot of trauma that happens from where these boys come from."